Drawings, Doodles, & Scribbles, Esqs. Funny books for kids are my favorite kind of children’s books–of course, since I attempt to write them myself. I love funny anything–I’m easily amused. I’m less amused when things are trying too hard to be funny. One bugaboo for me in humorous picture books are pointlessly silly names. A place named Silly Town does not make the town silly. But if you thought of a silly made-up word, like Rackamooguchaville, that could be funny. Sometimes you can use “on the nose” names in an ironic sense, as in TV-commercial characters “Captain Obvious” or “Interrupting Chicken.” Those are funny because of their unexpectedness and the way they make us anticipate funny behavior on the part of the character. They are ironic. Unlike adults, children don’t get irony, so where does the humor come from? Of course, one could write a dissertation on the topic, but here are few thoughts: often, the laughs come from knowing more than the main character, or being smarter than the main character, or seeing a bully get outsmarted. Kids have a strong sense of justice. And they also like reading about kids who get away with things. Of course, there are lots of good funny books for children to read, some of them recent, but these are just a handful that have reliably tickled my humor bone over the years. 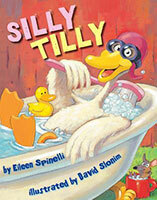 Actually, one of the really laugh-out-loud books I can think of has “Silly” in the name, Silly Tilly by Eileen Spinelli, who’s one of my favorite picture book writers. Silly Tilly is not only hilarious, but it has heart. It’s the story of a goofy goose whose antics, which include wearing a pancake for a hat, sitting on a birthday cake, and kissing a fish, annoy her farm-mates so much they ask her to leave. But then, they miss her. David Slonim’s soft, unusual color palette and realism remind me of Al Jaffee. This funny rhyming picture book makes me crack up every time I read it! The Wolf Who Cried Boy is a howl. The illustrations alone are enough to bring on joyous glee. To tell the truth, I have no idea if kids find it as funny as I do. I should try reading it to some. Again, the illustrations have an irreverent, Mad magazine vibe. This fractured fairy tale turns the traditional one on its head–a young wolf is interested in feasting on boy, but his parents tell him boys are hard to come by. The burgeoning prankster keeps making up stories about boy sightings, til a troupe of Boy Scouts appear. 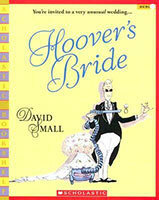 The story and art both have a real edge and lots of tension, which makes it a memorable funny book for kids. See the video at the end of the post. 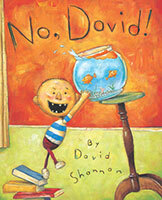 No, David! by David Shannon has hardly any text, but the expressionistic paintings capture the unsayable. The cheeky character is truly out there, and the way the images capture the moment AFTER he’s completed his latest transgression is what makes the deadpan humor so successful. When I first read this I thought maybe this funny picture book was better for older kids, because of the longish lines of rhyming text and the fact that it’s a love story between a man and a vacuum cleaner (brand name and all). It seems to be a parody of consumerism. But hey, that’s exactly what little kids need. Margie Palatini’s Zoom Broom, or just about any of her books. She’s one of the most reliable humorous authors around. She uses amazing wordplay, with way more zingers than the Dowager Empress in Downton Abbey. I’m glad she did a lot of books back when it was okay to write longer picture books, because I can’t get enough of her words. Likewise, anything illustrated by James Marshall. I’ve posted a readaloud to Harry Allard’s Miss Nelson is Missing over here. Marshall’s illustrations are so comical. The story is riotous, too. The subtlety is remarkable. The Wolf’s Chicken Stew by Keiko Kasza–I’ve got wolves on the brain today. This is just a sweet, simple story that has stuck with me for years. The art is beautiful, and the characters, while more or less stock (groan), project warmth. It’s short, but long enough to enjoy the words. The only malice comes from the wolf being hungry and trying to get more mileage out of his dinner. I love how understated the whole thing is. Falling for Rapunzel by Leah Wilcox, illustrated by Lynda Monk. This is another fractured fairy tale, this time taking on Rapunzel. She’s self-absorbed and not listening carefully to her suitor, who’s asking for her hair. She’s like Amelia Bedelia, but she’s not sympathetic and well-meaning like Bedelia. In this case you’re laughing AT Rapunzel, it’s a cautionary tale, arguably feminist, because the ditz doesn’t get the prince. In the end, everyone’s happy. The rhymes won’t fail to get guffaws. As you can see, even in picture books, funny books for kids can be deep, they can have social commentary, they can be wacky or subtle, they can be subversive in the best way, questioning or upturning the order of things. These books are not like broad sketch comedy, they’re about characters. Because they’re picture books, they can go further with absurdity. It was interesting for me to make this list, because I realize these funny books for kids have influenced me not only in what I write and draw, but how I think. If you’re reading this, can you think of some funny books that have stuck with you and think of why? I’d like to hear about them in the comments. This entry was posted in children's books, funny books for kids, humor, picture books and tagged funny books for kids on March 12, 2016 by admin.